Not to be confused with Toni Cipriani, a supporting character from GTA III and the protagonist of GTA Liberty City Stories. Toni is the DJ of several pop stations throughout the Grand Theft Auto series. She has appeared on Flash FM in Grand Theft Auto: Vice City and in Grand Theft Auto: Vice City Stories, where she has help from DJ Teri. In Grand Theft Auto III, she is the DJ of Flashback FM in Liberty City. As a DJ of Flashback FM, Toni reminisces about her hedonistic lifestyle during the 1980s, an aspect of her that would be retconned during her appearances in Flash FM. According to her chatter between songs during her early career in Vice City, Toni is an excited, Valspeak-using party-girl who gets invited on tour buses and to backstage parties, notably to one with Love Fist. However, she expects to do something important with her life by the time she's 30 — an in-series joke, as she is ironically still a radio DJ fifteen years later, in Liberty City's Flashback FM. As further reference to GTA III, Toni mentions in Flash FM that "I was dancing with my lighter and my hair went up like a Christmas tree." on Flash FM, an incident she has since forgotten in GTA III when she claims, "Luckily I've never have been [on fire]... I've done a lot of crazy things, I can tell you that... but I've never been on fire... at least not to my knowledge. ", and later on she mentions being asked by friends: "do you remember the 80s? "; to which she replies: 'well, I certainly don't remember anything else since then!" 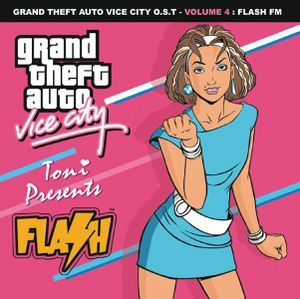 Toni appears in the GTA Vice City Stories rendition of Flash FM (circa 1984) as a sidekick for Teri, who seems to be in control of the show. Both Teri and Toni share a mutual hostility with each other and exchange vicious insults regarding the other's sexual and drug habits, with Toni often gaining the upper hand. It is also implied throughout the show that both are under the influence of large amounts of cocaine whilst on the air. It is hinted that Teri, in her mid-twenties, was considered too old to be hosting Flash FM and was probably fired by 1986, a possible spoof of the high turnover rate of MTV VJs due to age, leading to Toni's rise as the sole DJ of the station. Toni is voiced by Maria Chambers in all her appearances. Toni has a star on the Vinewood Walk of Fame in Los Santos, San Andreas in Grand Theft Auto V.
There are also a few billboards on buildings in Los Santos that feature Toni. This page was last modified on 9 January 2014, at 04:49.